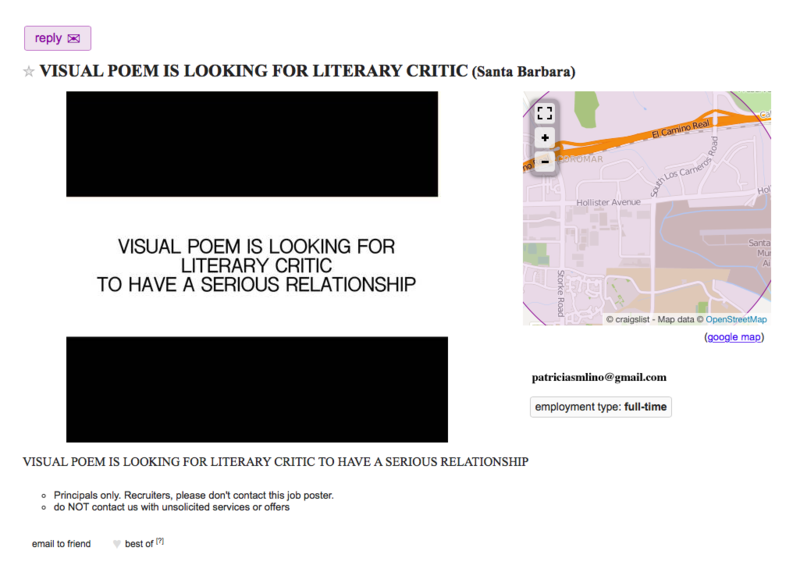 VISUAL POEM IS LOOKING FOR LITERARY CRITIC TO HAVE A SERIOUS RELATIONSHIP is a poem-performance made and performed between the US and Colombia in 2018. The poem-performance began as an online announcement on Craigslist (left), to which several unknown individuals answered to by e-mail. A big part of the same individuals interpreted this poem-performance as a pretext to have a romantic or sexual encounter. Later, the version in Spanish of this poem-performance (below) was distributed among academics in a Latin American studies colloquium at Universidad Javeriana. The poem-performance was not misinterpreted this time, which makes us think how context is crucial to any performative exercise.